For many products, a single brand name stands for the height of quality, innovation, and charismatic, diverse creations: Apple for electronics, TESLA for cars, Disney for entertainment. 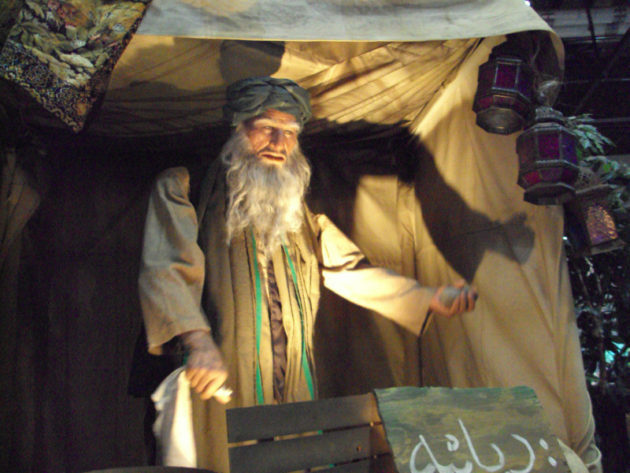 In the unique market of animatronics, we believe our company, Garner Holt Productions, Inc. (GHP) is the first and last name for exceptionally well-designed and built figures for parks, attractions, and other locations around the world. And in 2017, the company founded by a teenager will celebrate its 40th anniversary. “When I first started my company, I was out in my parents’ garage with one card table,” said Garner Holt, GHP founder and president. “I was 16, the only employee, and still in high school. Now I’ve got a 70,000 square-foot garage and hundreds of card tables!” All that – plus close to 100 talented employees – helps establish GHP at the apex of an unusual and esoteric line of business. What followed was a backyard haunted house that attracted more than 100 guests on Halloween night – “To my delight and my parents’ horror,” said Holt – and a larger, more elaborate version at a local shopping mall the next year. Between Halloweens, Garner came across the August 1963 issue of National Geographic Magazine in a classroom at school, featuring an in-depth story about Disney’s earliest Audio-Animatronics efforts for the 1964 New York World’s Fair, including the first iteration of the famous Mr. Lincoln figure. Suddenly, Garner was interested in much more than the relative simplicity of a haunted house. “I wanted to build my own animatronic person,” said Holt. “I thought of doing a figure depicting Uncle Sam that was sort of similar to a Lincoln, which was a good fit for the US Bicentennial in 1976. It would stand up from a chair and do a show.” In the pre-Internet days of the late 1970s, a teenager desiring to build an animatronic human (in his garage…) faced almost insurmountable challenges. “I had pictures of the Lincoln figure from the world’s fair from National Geographic,” Holt continued, “But that was about it. I went to Disneyland a couple of times and was fortunate to meet one of the animatronics maintenance guys, who told me a little bit about pneumatic and hydraulic cylinders and steel frames.” Holt set a goal of having the figure ready for July 4th, 1976. Working at home (in the garage) writing the script at school (and recording a history teacher’s voice), designing the mechanism in drafting class, and begging, borrowing, and (not quite) stealing all the time and materials he could muster, young Holt prevailed. He presented his animatronic Uncle Sam at the same local mall where his haunted houses had thrilled visitors the previous year – and both the haunted house and Uncle Sam were profit-generators for their young creator. In the summer following Uncle Sam’s knockout debut – which netted Holt lots of local and even national publicity – he decided to found a company, and, in July 1977, incorporated Garner Holt Productions. Not long after, he tested out of high school, allowing him to skip his senior year and to focus on perfectingUncle Sam (the original’s frame was steel fence posts and door hinges) and growing his business. Holt soon found other clients, including more haunted houses and trade show exhibits. For one scientific display, Uncle Sam transformed to Dr. Johnson. Now we jump ahead a few decades in our history, to the present day. GHP is now ranked the largest animatronic designer and builder in the world. With its creative design capability for attractions, exhibits, and more, plus fabrication of show action systems, special effects, sets and scenery, GHP may also be the most complete design and production organization in themed entertainment. Holt has continuously focused on novel and ever more realistic animation for decades. One of GHP’s most famous creations is Wendell the unicyclist. While the figure is a popular character at trade shows because of his ability to ride a unicycle with no visible means of support, the fluidity and lifelike motion of the character add tremendously to the effect. “Making a figure ride a unicycle is one thing,” Holt said, “But making it in such a way that it looks like a living person doing it is a huge challenge.” In the same way, much of GHP’s current R&D work is directed toward an all-new, electrically-actuated head. “The subtleties of facial expression are one of the trickiest things to replicate with animatronics,” said Holt. “Every time a university comes out with a new expressive robotic head, there’s a big deal made about it, but to me, the results just aren’t really convincing. My goal has been to make an astonishingly realistic human face. We’ve done it.” Following small steps taken in the past decade to add subtle realism to animatronic human faces at GHP – including smiles, frowns, lip curls, eyebrow motion, and more – the new expressive head currently in production is expected to prove a milestone in animatronics’ realism capabilities. “Some of the technology was developed for a project we created for the US government,” explained Holt. “We created a series of animatronic characters for a Marine Corps training facility that could be either friendly or hostile, and facial expression played a huge role in that.” In that exercise, currently in use at the Infantry Immersion Trainer at Camp Pendleton, California, figures could go from passive villagers who smile and greet trainees to hostile enemies with frowns and scowling brows, as they drew handguns, threw grenades, or threatened with other weapons. The immediate visual transformation of the characters has brought unprecedented versatility and realism to the training environment. GHP’s current fully-expressive face project will ultimately prove much more peaceable, while using some of the mechanical/silicone interface lessons learned with the Marines. Bill Butler (left) is Creative Design Director of Garner Holt Productions, Inc.